Peter Drucker, author and management consultant, once said, “Entrepreneurship is neither a science nor an art. It is a practice.” The Uncle Sam’s Helping Nieces 4-H Club in Philadelphia, NY, started practicing at a young age by opening a store in their local Grange Hall. 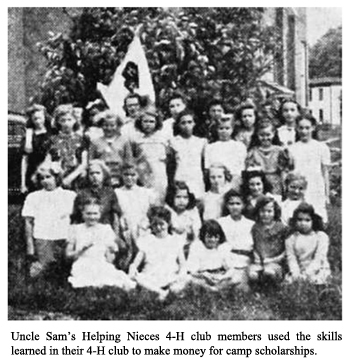 The enterprising group of girls was featured in the August, 1944, issue of National 4-H Club News. WWII, the members held a weekly rummage sale from their store. The girls collected clothes that had been outgrown or were otherwise unwanted. Sometimes they used their sewing skills to make minor repairs to holes or buttons or to give a garment a fresh look by adding lace or colorful touches of fabric from their scrap bag. They collected old jewelry to send to soldiers overseas to use as barter. The girls were responsible for selling the items and keeping proper financial records. A member who was leaving the club donated an old wagon. The club painted it green and white and used it to make collections of items to sell. The money earned in their store was used for 4-H camp scholarships and other club purposes. Do you have any entrepreneurs in your club? Give it a try and find out! There are 4-H entrepreneurship 4-H activity and helper’s guides available from National 4-H Supply (4-H Mall) and some state 4-H programs. Discuss in your club ideas for starting an entrepreneurship project. What items or services might you provide? How would you manage your business and the funds earned? The 4-H entrepreneurship materials will guide you through the process of planning, preparing, implementing and finishing a 4-H business. You can have a successful 4-H business like the Uncle Sam’s Helping Nieces4-H club did over 70 years ago. This entry was posted in History and tagged 4-H History, Uncle Sam's Nieces by Jim Kahler. Bookmark the permalink.